Web and eCommerce Sites Disaster Plan - There's not much you can do to prevent many disasters. Exposures range all the way from catastrophic earthquakes or hurricanes to relatively common problems like a fried motherboard or crashed hard drive. Though you can never prevent those types of things from happening, you can take measures to protect yourself from the resulting damage when it comes to your website. The web presents interesting challenges with regards to disaster recovery. The virtual nature of the web means that many regional phenomena that will affect you where you live may have no effect on your website. The flipside though is that is that you can be running a website out of Halifax, Nova Scotia, but have an earthquake in California take down your website because that's where your hosting company has its data centers. When you combine these issues with the fact that digital media tend to be far more fragile when compared to traditional paper documents. I'm sure you can appreciate why we need a different kind of disaster recovery plan than a traditional bricks and mortar operation. A website is composed of three parts. Janco's template address all of these issues. But the critical point is that neither element can be ignored, and physical, IT and human resources plans cannot be developed in isolation from each other. (In this regard, Business Continuity / Disaster Recovery has much in common with security convergence. ) At its heart, Business Continuity / Disaster Recovery is about constant communication. Preparation for Disaster Recovery / Business Continuity in light of SOX has two primary parts. The first is putting systems in place to completely protect all financial and other data required to meet the reporting regulations and to archive the data to meet future requests for clarification of those reports. The second is to clearly and expressly document all these procedures so that in the event of a SOX audit, the auditors clearly see that the DRP exists and will appropriately protect the data. Disaster Recovery Business Continuity Template (WORD) - comes with the latest electronic forms and is fully compliant with all mandated US, EU, and ISO requirements. 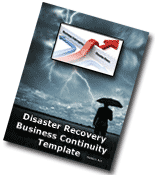 Disaster Recovery Business Continuity Template - Full template with all of its attachements. 300 IT Job Descriptions including all of the job descriptions contained in the Premium edition.